My love affair with this series continues. We fast-forward decades after the end of the previous book. Scotland is a perilous place as allegiances are torn between the Norse king and the Scottish king. Hanna is a woman on a mission of revenge against the Scots, driven by the pain and despair of losing her family when raiders invade her home. Alex is a man mourning the loss of his wife and three children. and has no desire to wed again. When the two of them meet and clash, there is so much mistrust and prejudice to work through. I have to admit I've been in love with Alex since The Highlander's Crusader Bride and totally fell for him in this story. Out of all the women in the series, Hanna is one woman whose distrust of the Scots is fully justified. So Alex had his work cut out breaking down her barriers. This story is heart-wrenching in places. But it makes the happy ending totally satisfying. One of the best highland romances I've read. Absolutely loved it. Best book of the series! Alex drew Hanna close, wondering if she would resist him. To his surprise, her hesitation was brief, and he wrapped his arms about her. He drew her with him until he reached the hearth, then sank to his knees before her. Cathy MacRae lives on the sunny side of the Arbuckle Mountains where she and her husband read, write, and tend the garden—with the help of the dogs, of course. You can visit with her on facebook, or read her blogs and learn about her books at www.cathymacraeauthor.com. Drop her a line—she loves to hear from readers! DD MacRae enjoys bringing history to life and considers research one of the best things about writing a story! With more than 35 years of martial arts training, DD also brings breath-taking action to the tales. You can connect with DD through www.cathymacraeauthor.com. It’s always exciting to hear from readers! Caught between two kings vying for sovereignty of the Isles and Western Scotland, Hanna of Hällstein has lost everything—and vows to repay the Scots for the deaths of her husband and children. Fleeing the smoldering ruins of her village, Hanna crosses the Strait of Mull and chooses the Laird of Clan MacLean as the object of her revenge. Alex MacLean has buried a wife and three children. 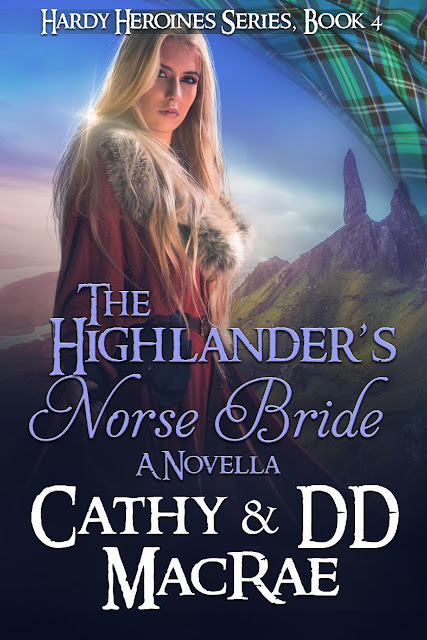 Ignoring the clamors for him to wed again and produce an heir, he finds himself drawn to a Norse refugee who defies him and tests the limits of his patience—and his power as Laird. Torn between revenge and honor, Hanna fears setting aside her vow of vengeance means she has lost her reason for living. Alex is determined to save her, even if it means defying the king.